Many people think that the only job in event planning is the role of event planner. However, it is much more important to realize the scope of this industry, and the millions of jobs that exist. The industry offers a full range of opportunities for anyone who wants to find their first event planning job that could ultimately become an entire—and successful—career. Corporate: For those who have strong organizational and office skills, the truth is that administrative assistants and office managers are organizing a full range of events in the corporate world. Perhaps it is as simple as organizing and scheduling department meetings each week, but that’s exactly what event planners do. Marketing departments often organize client events and sales meetings. Human Resources departments may be in charge of the company picnic or holiday party. Procurement departments get involved in establishing contracts with outside vendors, such as airlines and hotels, and they may be involved in planning and executing many corporate events. Event activities are part of many corporate positions, and it simply requires some creative thinking to discover those positions. The titles of those who organize events in corporate positions are about as varied as the roles that exist. Association: Just like their corporate counterparts, individuals who work in associations will organize a full range of meetings and events. There are the obvious meeting planning jobs, but there are many other less obvious positions at associations that still require similar responsibilities. Many associations typically hold a range of educational programs throughout the year, and that’s exactly what event planners do. If you check out most association websites, you’ll find that they are holding webinars, regional meeting, annual conventions, and more. Those who want to find event jobs in an association environment simply need to consider the various departments that get involved in any aspect of these programs. Find a job that fits your interest and grow from there. Nonprofit: Nonprofits are similar to the association environment in that their focus is often to organize a range of community educational programs and activities related to the cause and its mission. However, a good piece of advice for anyone interested in pursuing any career in a nonprofit environment is that it is vital to choose a cause in which you have a personal stake. Many people seek jobs in a nonprofit environment because they think that the position will be stable and safe from the economy’s impact, but this is not always true. The good news is that many leaders in nonprofits still want to have a team that cares about the cause. They can sense who is sincere, and which candidates are simply looking for short-term experience. Government: Government event jobs are a breed unto themselves. While there’s probably a good reason to be skeptical about whether some folks get these positions as a result of political connections, the reality is that the work is such that most cities and local governments do need professional event planners in these roles. Common programs organized by special events departments in cities include community festivals throughout the year. But there are many other positions to consider. For example, many government agencies hold annual conferences and events within their agencies, and this work needs to fall upon professional event organizers. Hotels: Those who organize events on behalf of their organizations are typically viewed as the “buyer" side of the industry. The supplier side offers many more opportunities for event planning jobs. And the sheer volume of hotels out there means that there are many job opportunities in the convention sales and catering arena. Event jobs in hotels do have a demanding schedule. That is, event and meeting space is frequently busy during the weekdays with seminars and conferences; evenings may be used for more formal business events or fundraisers and weekends are committed to social events such as weddings throughout the year. Restaurants: Just like their hotel counterparts, restaurants have private function space and event, and catering managers are responsible for overseeing those programs. Restaurants are probably the most popular offsite venue for hosting a variety of corporate and social events. Specific Services: Imagine the range of businesses that play some sort of role in planning or executing corporate and social events. Just begin to consider a little brainstorming, and you’ll think about businesses such as party rentals, tents, florals, staging, security, transportation, photography, catering and more. Each of these employers will need someone who offers strong selling and account management skills with their event clients. 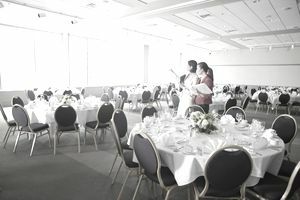 It is advantageous to have at least an appreciation for all of the various people who are involved in planning and executing event programs before beginning any job search in this industry. The larger your perspective about event jobs, the greater the number of possibilities that will present themselves to you.